One of the more difficult levels of coaching is Junior High School athletics. Most of the players have had little or no experience with the sport prior to the seventh grade. A coach at that level has to first school the players in the basic fundamentals before becoming involved with the intricacies of the sport. Coaches at the sub-varsity level also receive very little recognition for their efforts. Usually the only people to follow their teams are the varsity couches and the parents of the players. One of the most successful coaches in the state of Ohio at this level was Dave Jones, whose exploits as coach at Northwestern Junior High School in Congress in basketball, baseball, and track have become legend. Dave was a Congress student throughout his school days from grades 1 thru 12. He lettered for four years in both basketball and baseball and he compiled a career batting average of .464 over his 4 years. Upon graduation, he attended college for a brief time, but economic factors caused him to leave school. His love of sports continued and he played on several championship teams for the West Salem Merchants. He was instrumental in organizing the Congress Athletic Club, a charter member of the Wayne County Sports League, a team which later evolved into the Northwestern Athletic Club. He coached Hot Stove baseball in the summer and led five different teams to the state playoffs. The lure of teaching continued to beckon and Dave eventually returned to college and graduated from Ashland with a 3.9 grade average. He returned to his alma mater at Congress, now Northwestern Junior High School and proceeded to amass an eighteen year record in basketball, baseball and track which can only be described as remarkable. His basketball team won 381 times while losing but 84 games. Included were four Wayne County Jr. High titles and nine additional invitational tourney winners. In those years the county did not conduct a championship tourney. 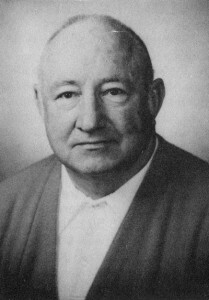 Dave Jones coached teams did not lose a basketball game over a ten year span from 1956 to 1966. The track teams had an even better winning record as they triumphed in 127 dual meets while losing 22 times. Four County titles and three invitational meets were won. Both of these marks took a back seat to baseball, however, as the young Huskies won 17 games, losing but 9 over the years. His eighteen year record in the three sports showed 675 victories against 115 setbacks for a winning percentage of over 86 percent. The foundations established with these squads were reflected in the spectacular success of the Northwestern varsity teams during this era. Included were 4 state championship teams, two in baseball and two in basketball. Dave went on to become the Athletic Director at Black River High School where he breathed new life into a financially decrepit athletic program. He also continued his teaching and coaching and in twelve years added another 438 wins to his record coaching at levels from the fifth grade an up. He finally retired from the teaching profession, however, he has continued coaching at Northwestern at the 5th, 6th, and 9th grade levels. It is only fitting that the most outstanding Junior High School coach in Wayne County history be a member of the Wayne County Sports Hall of Fame.